MyWay Mobile Storage of Baltimore was a proud sponsor for the sixth annual Naptown barBAYq and donated four portable storage units to assist the Naptown barBayq festival staff. 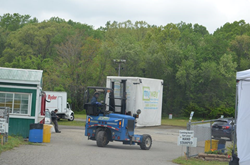 MyWay Mobile Storage of Baltimore, the leading provider of moving and storage solutions, provides quick and easy to do-it-yourself moving and portable storage to meet your needs at your location or in our climate-controlled, secure storage facilities. The 6th Annual Naptown (Annapolis) barBAYq Contest & Music Festival, hosted on May 6-7, 2016, by the Parole Rotary Foundation, Inc., was a great success. The festival took place at the Anne Arundel County Fairgrounds in Crownsville, MD. Proceeds from the event benefited local children’s charities. MyWay Mobile Storage of Baltimore was a proud sponsor for the sixth annual Naptown barBAYq and donated four portable storage units to assist the Naptown barBayq festival staff. Because the festival spans two-days, many items must be left overnight at the Anne Arundel County Fairgrounds. Rather than transporting valuable items back and forth, the MyWay Mobile Storage boxes allowed organizers to confidently store possessions throughout the weekend. The Naptown barBAYq and its contestants and judges are officially sanctioned by the Kansas City Barbeque Society, the world’s largest organization of barbecue enthusiasts with more than 14,000 members. An estimated 10,000 people attended the event this year to savor ribs, chicken, pork, brisket and a variety of other food dishes; 64 teams participated in the competition for cash prizes. The “Grand Champion” of the event was Big Ugly's BBQ -- and winner of the People's Choice Wings 2016. Astro Pigs BBQ took home the consolation price as the Reserve Champion and the People's Choice Pork award went to Sauce This BBQ. MyWay Mobile Storage of Baltimore is passionate about being involved in the community and is honored to be a part of events such as the Naptown barBAYq. The versatility and convenience of their portable storage solutions allow them to support a variety of events and organizations.